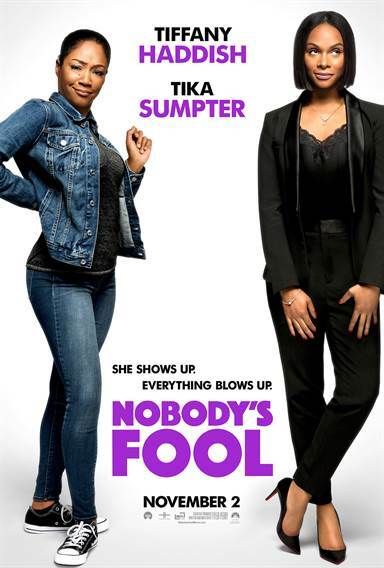 Download Nobody's Fool in Digital HD from the iTunes store. Nobody's Fool images are © Paramount Pictures. All Rights Reserved. Tyler Perry (Gone Girl) has made a career of creating films for a distinct demographic and entertaining masses for years in the process. His Madea series of movies are successful comedies that are a hit with audiences every time they are released. Studios know that he can make movies quickly and generally with a modest budget but that reap strong profits at the box office so it is no surprise to see his penned/directed feature film, Nobody's Fool, heading to theaters this month in anticipation of the Thanksgiving holiday weekend. Starring the latest "it" female comedian, Tiffany Haddish (Girls Trip) this movie promises laughs that will fill seats. Danica (Tika Sumpter; Southside with You) has a great life. She has a two-bedroom apartment in Manhattan, a six-figure job as an account executive in an ad agency, and a boyfriend… that she has never met and who lives on an oil rig. She also has a sister, Tanya (Haddish), who has just been released from jail that comes to live with her. As Danica lands an ad campaign for a huge perfume company, it seems everything is going right for her…until it isn't. When Tanya moves in she thinks that Danica is being "catfished" by her so-called boyfriend, Charlie (Mehcad Brooks; Supergirl) and sets out to prove it. She enlists the help of a television show that finds out that Charlie really doesn't exist, or so it seems. A brokenhearted Danica loses the perfume ad, fights with Tanya and uses Tanya's boss, Frank (Omari Hardwick; Power) as her rebound for her heartbreak. However, after several months Danica and Frank have become close and just as she realizes she loves him things suddenly become complicated and she breaks Frank's heart angering Tanya. Of course, after some soul-searching and groveling, all's well that ends well. Are you confused yet? Well, you should be. There are several complications that arise in this comedy that might give you whiplash if you aren't careful. Perry's knack for writing pop culture scripts is admirable but sometimes he offers too much and in this case too many plot points bog down the script. There is also no credit for originality as the film is predictable and you can see the story coming from a mile away. However, Perry does know how to infuse the story with funny moments and in this case they are peppered throughout. Adding to the humor is the immensely talented Tiffany Haddish and she is certainly in her element here. It is obvious that she ad-libbed many of her "rants" in the scenes and a couple of her lines are pure comedy gold. Unfortunately the same can't be said for Sumpter as her performance is rather flat throughout. Amber Riley (Glee) who plays Danica's coworker and friend delivers a couple of laughs but pales in comparison to the ones offered by Academy Award winner Whoopi Goldberg (Sister Act) as Danica and Tanya's marijuana pot growing mother. The scene with Haddish at the kitchen window is simply hilarious. There is also a well-placed yet stupid cameo by Chris Rock (Everybody Hates Chris). While there are definitely some laughs to be had one shouldn't expect too much as this is still a Perry production. The film is crass and vulgar at times and really has very little point other than to be a vehicle for Haddish to do her schtick. Perry knows his audience and plays to them throughout. He is "Nobody's Fool" and he knows what packs them into theaters.